Bill.com Featured in USA Today. Billcom adds open APIs to banking platform. Blackhawk Network Announces New Financial Service Products in Canada. Startup Central looks at Heckyl, Clari5 and BankBazaar at FinovateAsia. VentureBeat considers SecondMarket’s partnership with Angellist. M.O. interviews Constancio Larguia, CEO & founder of Weemba. SiliconBeat looks at Personal Capital’s 401(k) product. Kabbage Becomes Exclusive Funding Provider for Bonanza Sellers. American Banker reports: Bill.com Ties Cash-Flow Tools to Banks’ Small Business Software. Finextra reports UBank gathers transaction data for spending comparison site. Xero to dual list on ASX and NZX. ShopKeep POS announces entry into the quick serve market with full kitchen printing capabilities. Mashable lists SimpleTuition, ReadyForZero, and Tuition.io as tools to help minimize student loan debt. Capital Access Network moves Headquarters to NYC. Crowdfund Insider reports SoMoLend Announces New York Expansion. To learn more about Weemba, watch its FinovateFall 2011 demo. Bank Technology News reports HomeDepot now accepts PayPal payments at all 2,000 retail stores. Des Moines Register interviews Jordan Lampe, Dwolla’s director of communications. BancVue completes sale of $120 million credit card portfolio to First Arkansas Bank & Trust. ThreatMetrix launches program to report malware capabilities. Accounting Today selects Bill.com Receivables for its Top New Products of 2012. Diversinet names Dr. Hon Pak as CEO. Sallie Mae & peerTransfer partner to facilitate international tuition payments. Credit Karma celebrates 4-year anniversary. Reuters looks at FINRA and Brightscope to give more information on financial advisors. Omaha.com looks at how Dwolla survived the downturn. Weemba celebrates 6 months of operation, unveils operating stats. Handpoint Headstart wins 2012 Channel Awards. can also follow all the alumni news headlines on the Finovate Twitter account. Last week, The Early Show on CBS featured three Finovate alumni (see video below). The newscast describes how Weemba, Lighter Capital, and Rebirth Financial are all working to find funding for small businesses. Maine Public Broadcasting Network profiles CashStar. Ryan Alfred, BrightScope CEO, & Alexa VonTobel, LearnVest CEO, also make Forbes list of “30 under 30”. Bank Technology News describes how Bill.com uses capital infusion to build a cash flow dashboard for businesses. SecondMarket’s homepage gets a makeover. The CBS Early Show features Weemba, Lighter Capital, and Rebirth Financial. The Wall Street Journal lists Prosper, Lending Club, and Weemba as resources for home financing. PayNearMe partners with iSend to simplify international gift giving this holiday season. Doxo wins Red Herring Global 100.
Credit Karma and Intuit team up to provide credit services within FI-branded environments. In the four months since its launch, Weemba has seen hundreds of loan applications that range from $1,000 to 1 million. Fox Business News recommends banking with Simple as a way to counter bank fees. The Sacramento Bee reports SafetyPay expands to U.S. marketplace in the airline & travel payments industries. GeekWire reports Lighter Capital awards undisclosed amount of cash to HireAHelper. Barganeering looks at what sets Personal Capital apart from Mint.com. Business Insider explores the differences between SecondMarket and SharesPost. Sun Life partners with Kony on claims mobile app. Weemba adds 3 financial institutions to its network of lenders. Two credit unions deploy Credit Karma’s tools on their online banking platforms. GoalMine to launch holiday gift card trade-in service. After yesterday’s CNNMoney article portrayed Lendio as a matchmaker, Bank Technology News published an article entitled, “Matchmaker Matchmaker, Make Me a … Loan?” that shows Weemba in the same light. City National Bank of Miami has been working with Weemba since launch. Each month we survey the Web-traffic performance of Finovate alums using data from Web-analytics company Compete. Out of 268 alumni, 80 had more than 10,000 unique U.S. visitors in September 2011 and are included in the tables below. Of those, 33 (41%) had more visitors in September than August. Year-over-year, 42 (52%) had traffic increases. 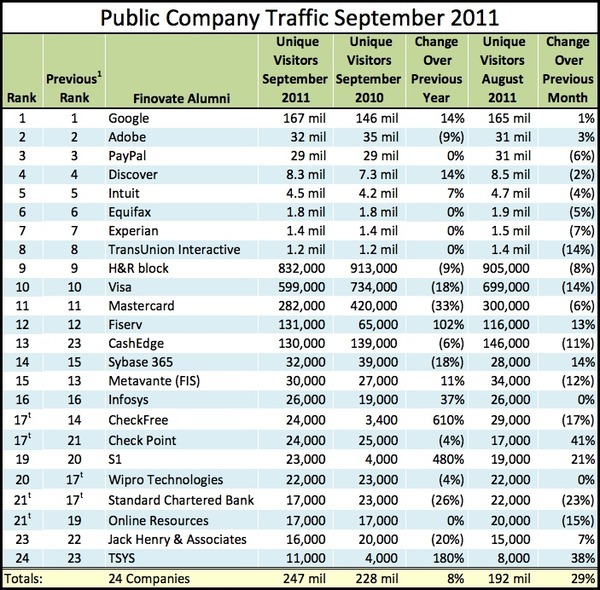 Seeking Alpha and Cortera had the highest traffic in September with 2.1 and 2.0 million unique visitors, respectively. Cortera also had the highest increase in number of unique year-over-year visits with over 1.5 more visits in 2011 than in 2010. Kabbage had the highest percentage growth year-over-year, up 280x. Weemba saw the highest monthly growth percentage with more than 7.5 times the number of unique visitors in September compared to August. SmartCredit.com had the highest increase in number of unique year-over-year visitors, growing by 126,000. CheckFree had the highest percentage growth year-over-year, with over 7 times the number of visitors this year than last year. Intuit had a notable increase in number of unique, year-over-year visitors, increasing by 300,000 visits. Check Point had the highest month-over-month percent growth, with 41% more visitors in September than in August. 1) The previous month recorded was July 2011. 1. We reviewed 268 Finovate alumni. Only those with at least 10,000 unique visitors in July are listed. 5. Compete estimates online visitors based on the activity of a panel of more than 2 million U.S. Internet users. It is only an estimate of traffic and may undercount at-work usage.